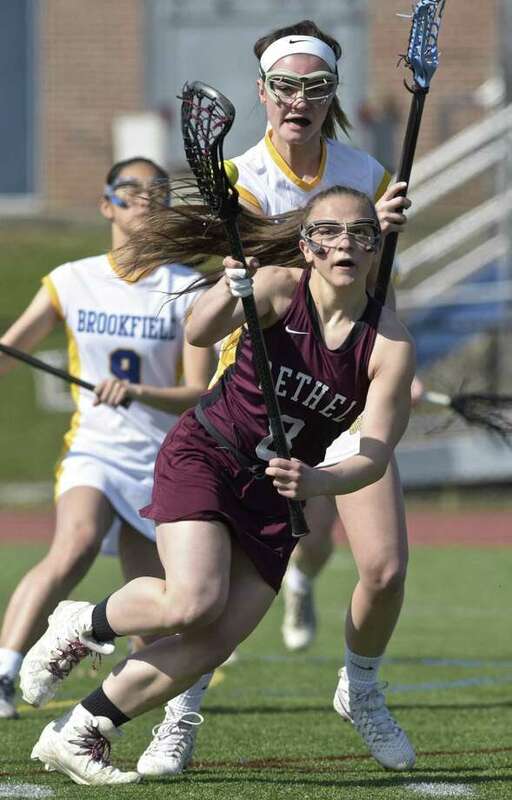 BROOKFIELD — The Bethel’s girls lacrosse team took its share of lumps in the first couple weeks of the season as its players learned to trust one another and work together. If Saturday’s game was any indication, things are beginning to fall into place. Playing in unison, the Wildcats recorded a 12-9 victory over Brookfield in a back-and-forth, non-conference clash. Vicky Gracy, Christiana Ruiz, Maranda Nyborg and Samantha Barnum each scored three goals to lead Bethel’s balanced attack, while goalie Anne Habeck preserved the victory with nine saves. Morgan Stankiewicz led Brookfield (2-3) with three goals, while Olivia Davidson scored two and Eliza Floyd, Riley Delehanty, Alexandra Heckmann and Carly Wallin each scored one. Amber Howe and Natalie Rossi shared time in goal and combined to make five saves. It was certainly a game of runs early on, as Bethel scored the first four goals, Brookfield scored the next five to take a 5-4 lead. The scores was tied at 6 with less than a minute remaining in the first half when Bethel regained possession. With 11.2 seconds to go, Ruiz set up Nyborg for the go-ahead goal. Though the Wildcats extended their lead to 9-6 early in the second half, they were far from out of the woods. The Bobcats came back with a rally of their own, and goals by Wallin and Floyd trimmed the Bethel lead to 9-8 with 10:16 to go. That was as close as Brookfield came, however, as Habeck made several key saves midway through the second half to protect the lead. Habeck was rewarded for her efforts when the Wildcats scored three goals in less than three minutes — two by Barnum and one by Ruiz — to open a 12-8 lead with 3:46 on the clock. These two teams will meet again, this time in a South-West Conference game, on Tuesday at 4 p.m. at the Rockwell School field in Bethel. Records: Bethel 2-4; Brookfield 2-3. Scoring: Be—Vicky Gracy 3 goals, 2 assists; Christiana Ruiz 3g, 3a; Maranda Nyborg 3g; Samantha Barnum 3g; Maggie Mossop 1a. Bk—Morgan Stankiewicz 3g, 1a; Eliza Floyd 1g, 1a; Riley Delehanty 1g; Alexandra Heckmann 1g, 1a; Olivia Davidson 2g, 1a; Carly Wallin 1g; Courtney Delehanty 1a. Goalies: Be—Anne Habeck (9 saves); Bk—Amber Howe (3), Natalie Rossi (2). Shots: Be—20; Bk—21.